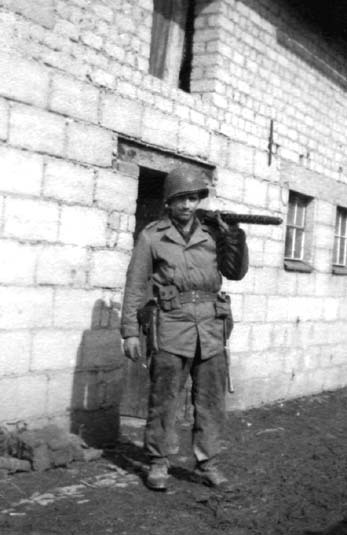 110th Infantry Co.'B', 28th Inf. Div. Toward the last of the war when the Germans made their last stand at Colmar, my unit was assigned to the Free French Army to help. My company went to Black Mountain, of the Vosges mountain range. We went to the top of the mountain and established a headquarters there. On the third day, I was in a squad of 12 men who were lead down into a valley below, that was surrounded on three sides by Germans. I was immediately sent with 3 other men to a machine gun outpost at one end of the valley. One of the men got killed by a sniper within 5 minutes after we got there. The three of us survivors set up the machine gun and held the position for three days without hearing anything from headquarters. On the fourth day, I felt I had to get back to headquarters somehow, to see what the situation was. It was during a blinding snow that I started out, hoping that the Germans wouldn't spot me. When I got about half way there, I saw a huge figure of a man, through the blinding snow. I stopped and then I saw who it was, it was my Lieutenant, Al Blozis. He had only been in the war for 5 days. He was a famous NFL League Foot Ball player. He had just played his last game in the playoffs just 30 days earlier. When I saw him, I was about to say something when I heard the rattle of German machine gun fire, and he dropped. I crawled on my stomach to see if he was alive. He was six foot six inches tall and weighed 190 pounds, but he was dead. I crawled back far enough where I thought I had a chance to get up and make it back to my outpost, which I did. We were not sure what to do. A little later an old man from the village came upon us and told us we needed to get out of there quickly, because the Germans had taken over. We were surrounded on three sides but the old man told us the only way out. We picked up all the things that we could carry. As soon as it was dark, we started out over the mountain. It took us 4 nights to make it to the top. We had to kill one lone German, who got too curious. We finally got over and just by luck, there was a GI truck heading back towards our division with the last of the supplies. The driver couldn't believe what he was seeing but he gave us a lift back to our outfit. 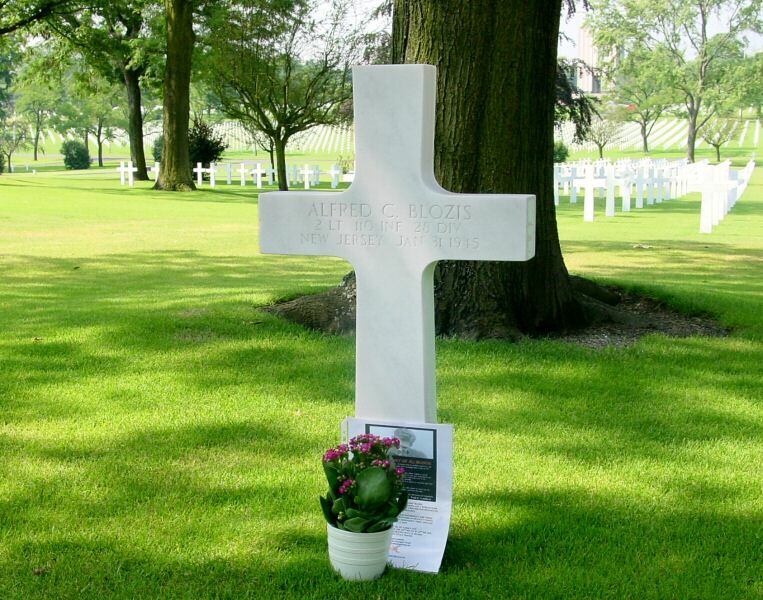 Gravesite of 2nd Lt. Alfred Blozis at the Lorraine American Cemetery, St-Avold / France. This is not where the story ends but, I will tell you what happened 56 years later, I was surfing the Internet for something when I came across the name "Al Blozis" I instantly recognized the name, so I read the story. It went on to say that during the war, Al had led a squad of 12 men down into the valley. When the Germans attacked, he had to pull the men out and get them out of there. The article said he was able to get 8 men out but still had 4 to find. The Company was pulling out but Al Blozis would not go until he found the other 4 men and got them out too. It went on to say he was killed while looking for the 4 men, but nobody knew any more than that. I was shocked and I immediately sent a message to the writer who was a member of the 28th Division but not in our company. He was an officer who knew Al Blozis. After word got around, I started getting letters from all over, wanting to know how Al died. Not so long ago I got a message from a distant relative of his, wanting to know about what happened to him. Nobody knew the story except me and my two surviving buddies, so I sent the details of the Lieutenant's death to finish the story. 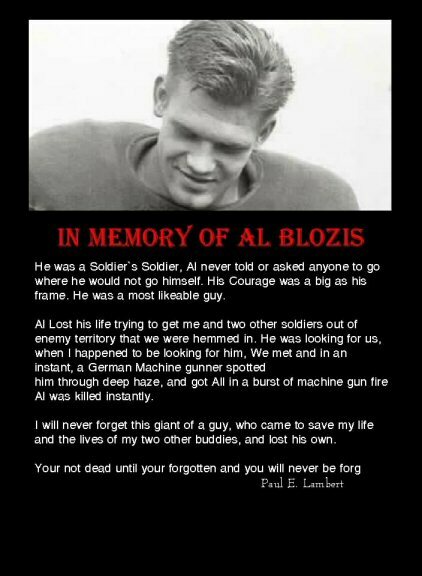 Al Blozis was a soldier's soldier. As far as escaping over the mountain at "Black Mountain", it was a bad experience, but not as bad as being in the Huertgen Hell. It was cold, wet, muddy and dark all the time and the tree bursts were constant. On one occasion, I was in my foxhole with my machine gun set up to cover the left flank, my assistant gunner was with me. He was a new recruit and this was his first day in combat. 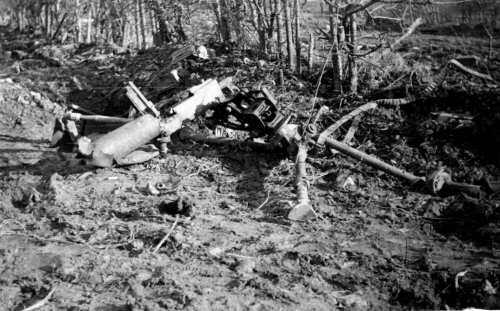 A German mortar hit about 20 yards in front of my fox hole, due to my training in boot camp, in a split second I was out of there, my reflex action was automatic. I shouted to my assistant Gunner to get out of here but he was too slow. I was barely out of there, when another mortar hit right in the foxhole. My assistant gunner never made it; the gun looked like a pretzel. I was called out to a field one day. I did not have the slightest idea why, and I don't remember where exactly where it was, except it was a sort of field. My other two surviving buddies were also there. We were lined up at attention and a car pulled up on the road beside the field, and two French Generals got out and walked over to us. They saluted us and then one by one, they presented us with the French "Croix de Guerre" medal. I still remember very clearly being in Belgium in December 1944, and standing on Guard as a big Tank unit went through town. I don't remember the name of the town, but I remember after I got off duty, I went into a small tavern and had some very delicious Dark Beer. I remember this because the beer was so good, it was different than any American beer I had ever drank. I also just thought of another thing. Me and my best buddy took out a German Machine nest which was giving my platoon a bad time. 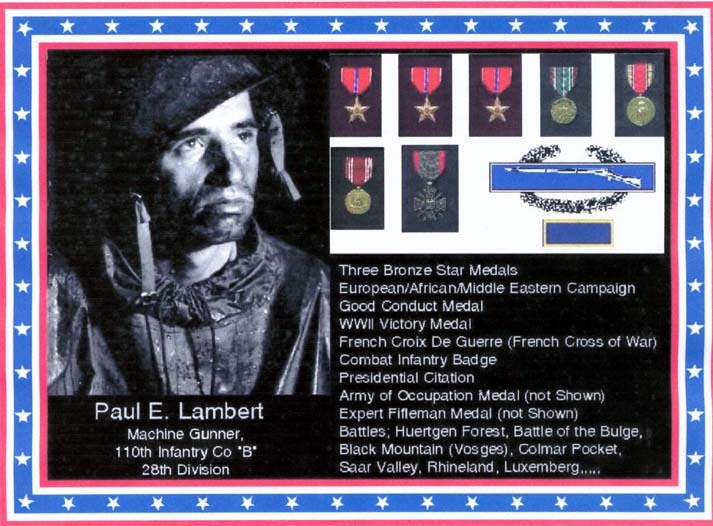 When the battle was over and we were back in a reserved position, our captain said me or my buddy would get an R&R in Nice France, for a week, but there was only one choice to go and we drew straws. I won and was flown back to Marseilles, France where I got on a train to Nice on the Mediterranean. It was like Heaven. I will never forget the wonderful treatment I got there. 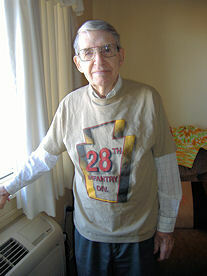 My good friend Paul passed away on April 18, 2009. I'll miss him as a warm and valued friend.